Tchaikovsky’s world-renowned 1812 Overture will echo through Bella Vista Farm Park on Sunday, November 11 to mark the Centenary of Armistice. The Overture will be played by the Castle Hill RSL Youth Orchestra and be accompanied by the Royal Australian Army “big guns”. Other activities on the day will include performances from the Castle Hill RSL Pipe Band and the RNSW Lancers Band. Federal Member for Mitchell, the Hon. Alex Hawke MP, said today we know 11 November as Remembrance Day, but its origins started 100 years ago when the Armistice ending the fighting during the First World War was signed. “The Australian Government through the Armistice Centenary Grants Program has provided $50,000 to each federal electorate across Australia to ensure the memory of those who gave so much in defence of our values and freedom live on. We owe it to those who went before to stop, remember and say thank you for another 100 years,” Mr Hawke said. “The Centenary Finale event has been made possible through the Armistice Centenary Grant of $6,928 to mark the centenary of the Armistice in a locally significant way. I commend the work of the Mitchell Centenary of Armistice Committee, led by David Hand with the assistance of Colonel Don Tait OAM, for their time and commitment in planning such a momentous event for the community to remember, reflect and honour those who gave the ultimate sacrifice for our nation,” he added. 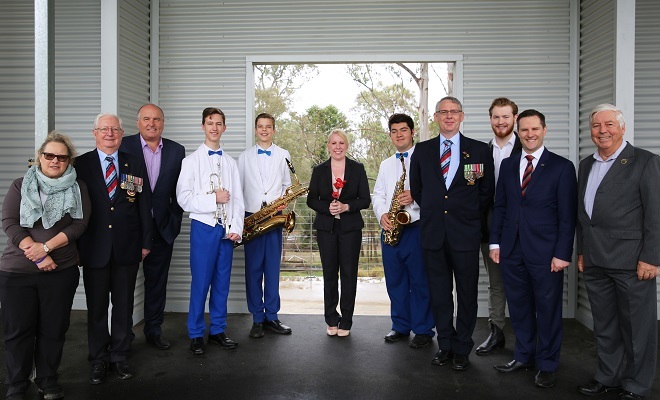 Castle Hill RSL sub-Branch has contributed $15,000 and The Hills Shire Council has donated $7,500, plus in-kind support to make sure the day is a success. “Remembrance Day is a significant event, and it’s important to remember the sacrifices made by our Hills Shire residents and those who contributed to the war efforts during World War I,” Mayor of The Hills Shire, Dr Michelle Byrne said. “That’s why Council is committed to making sure this event is one that our community and its veterans can be proud of, while also helping to educate and engage the wider community about the Armistice Centenary story,” she said. President of the Centenary of ANZAC committee, retired Colonel Don Tait OAM said that the Centenary of Armistice commemorations allow our community to remember the loss of so many Australians, to empathise with those who have been injured by war and to remember the end to WWI. “Remembrance Day means many things to me, but importantly it ended a war so that Australian Army, Navy and Air Force personnel could return home and restart their lives with their families,” Mr Tait said. “For me personally, I use the day to remember the sacrifices that so many service personnel made in WWI and, in particular, the 571 men from the Hills District who gave their lives so that we could live normal lives in this great nation of ours. “This Armistice Finale event featuring the 1812 Overture offers a great evening out for families and for them to experience an exciting and fitting program that remembers all Australians who have sacrificed so much for us,” he added. Gates open at 4.30pm. Attendees can bring a rug and a picnic. Food and coffee will also be available. While the event is free, attendees are asked to book via Eventbrite to give an idea of numbers.